Tapa comes from the Spanish word tapas, meaning light finger food. Traditionally, tapa is dried or cured beef although other meat like pork or chicken maybe used. It is best when fried or even grilled, often served with fried rice, fried egg and atchara (pickled papaya strips). 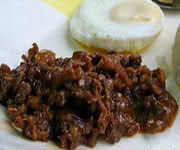 Tapsilog is the term used when tapa, egg and fried rice (sinangag) are combined in one meal which is served primarily during breakfast. In preparing tapa nowadays, meat is not dried anymore but fibers and other organic matters are added in the extenders to make the meat juicier. Serving portions will be more or less 16 servings per kilogram of meat. If tapsilog is sold at P30.00 – P40.00 per kilogram the gross sale is P480.00. Net profit is P240.00 considering that 50% of the sales is allocated for the rice, egg, atchara and other ingredients for cooking. 6. Place in white plastic container, with loose cover and cure at room temperature 8-10 hours or refrigerator (middle compartment temperature 1oC – 4oC). Don’t over cure to avoid souring. Please where to but phosphate, curing salt, caragreenan and isolate?